Abstract. When floods hit inhabited areas, great losses are usually registered in terms of both impacts on people (i.e., fatalities and injuries) and economic impacts on urban areas, commercial and productive sites, infrastructures, and agriculture. To properly assess these, several parameters are needed, among which flood depth is one of the most important as it governs the models used to compute damages in economic terms. This paper presents a simple yet effective semiautomatic approach for deriving very precise inundation depth. 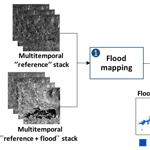 First, precise flood extent is derived employing a change detection approach based on the normalized difference flood index computed from high-resolution synthetic aperture radar imagery. Second, by means of a high-resolution lidar digital elevation model, water surface elevation is estimated through a statistical analysis of terrain elevation along the boundary lines of the identified flooded areas. Experimental results and quality assessment are given for the flood that occurred in the Veneto region, northeastern Italy, in 2010. In particular, the method proved fast and robust and, compared to hydrodynamic models, it requires sensibly less input information. How to cite: Cian, F., Marconcini, M., Ceccato, P., and Giupponi, C.: Flood depth estimation by means of high-resolution SAR images and lidar data, Nat. Hazards Earth Syst. Sci., 18, 3063-3084, https://doi.org/10.5194/nhess-18-3063-2018, 2018.